If there’s one company sponsor that’s synonymous with IndyCar, it’s Target. Sadly, that’s coming to an end, as Target will end its 27-year-long sponsorship of Chip Ganassi Racing at the end of this year, reports the Associated Press. New Target chairman Brian Cornell says he’s streamlining the company’s marketing efforts, and IndyCar didn’t make the cut. Target has sponsored the Ganassi team since 1990, seeing it through 11 championships and four Indianapolis 500 wins. Target was partially responsible for building the Ganassi team, as it sponsored Ganassi’s first car as a team owner. 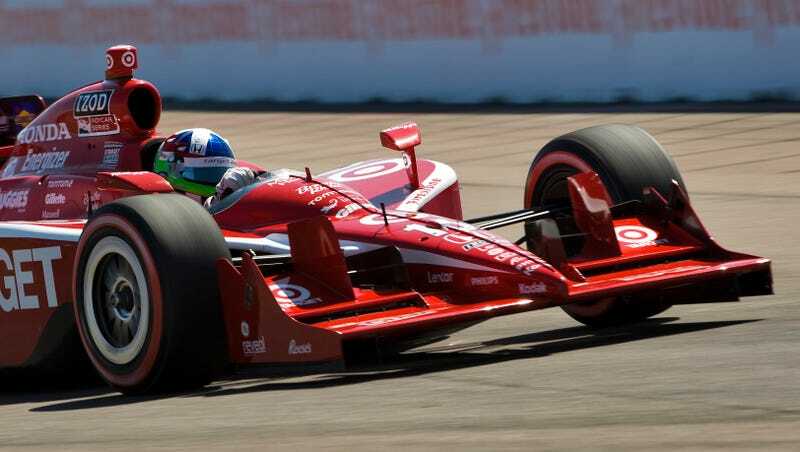 Current Ganassi driver and four-time IndyCar champion Scott Dixon has been sponsored by Target for an incredible 15 years. It was a really difficult decision that we made — we’ve been with Chip Ganassi Racing for 27 years and we are ridiculously proud of the success. But the Target brand is about being fresh and new, so we felt like this was the time to make the difficult decision and expand our sports marketing platform. The most telling piece of Nygaard’s words? IndyCar isn’t “fresh and new.” Ouch. Target was probably the series’ most visible sponsorship. Whenever I needed tampons, light bulbs, lawn chairs and ice cream in one go, sure enough, there was a good chance I’d see one of the Chip Ganassi Racing cars on aisle signage in Target. Target put IndyCar right in the eyeballs of people who wouldn’t normally even think of it. Sadly, it’s a sign of the times. Why sponsor a team when no one even tunes in for the series’ hundredth running of its most visible race? On the series’ side, this line of thinking presents a horrifying catch-22. How can they build IndyCar back up into a major player in racing if there’s no sponsors willing to back it? Worse yet, lack of funding makes existing teams less willing to take chances on up-and-coming talent. Ganassi told the AP that Dixon is “not a tough sell at all” to sponsors and remains optimistic about their chances of attracting another sponsor to replace Target in the next two months. But will it be anything as big as Target? It’s hard to say, as a large chunk of the IndyCar field seems to be hocking medications nowadays. Then again, it’s easier to sell a crowd that’s still clinging to the glory days of Indy’s past on diabetes meds than trendy designer collaborations. The one upside (at least for stock car fans) is that Target isn’t getting out of racing entirely. Target also sponsors Kyle Larson’s NASCAR Sprint Cup race car, that relationship will continue in 2017, the AP reports.